Thanks to everyone who wrote to the National Trust with concerns around the Conwy hydro-scheme and their hydro building policy within Snowdonia. Save the Conwy have received a reply from Justin Albert (Director National Trust Wales) through Elizabeth Wagstaff at Business Management. Interesting department to get a reply from; not direct from the director or from an environment committee but from buisness management. That in itself shows a lot about how the National Trust think of the Afon Conwy; a business asset. From what we can tell it is the same reply that everyone who wrote received regardless of the nature of their concerns. We also received a slightly edited version of this response from Dame Helen Ghosh (Director General) as well. This reply is attached below along with our original letter. It can be seen the National Trusts reply raises more concerns than it answers. Please take the time to read our response below, also attached as a pdf. Save the Conwy and Snowdonia Society have (alongside many individuals) written to the National Trust asking them to engage with us about our various concerns. Recently we received a letter in return from you, through Elizabeth Wagstaff at business management. The same letter was sent to everyone who wrote despite the different concerns raised. A slightly edited version of the same letter was also received from Dame Helen Ghosh. Due to receiving the same reply as others with different concerns it is obviously impossible to know if you have actually read our submission or not. I would take this opportunity to respond to specific points in your reply. This has not happened, apart from a brief appearance at an open day held by RWE there has been no communication with the community at all. We have recognised that standing aside from or opposing the scheme would not have stopped its development, and that it would have been simply moved further downstream to an area where we believe it would have a more damaging aesthetic and ecological impact. At present we have not seen any evidence that our actions or decisions in this respect have been wrong. I am unsure where this information has come from, presumably Keith Jones. It is entirely incorrect. The intake is to be built just upstream of the Penmachno Bridge, immediately after this the Conwy plunges down a steep cascade into a deep gorge. There would be no possibility of creating an access road to construct the intake weir downstream and no way of routing the pipeline from this point. Even if moving the intake downstream was possible it would significantly reduce the vertical drop thus reducing financial viability. With regards to the pipeline, if this was not tunnelled through the National Trust owned Dinas Mawr, it could only travel under the A5, unlikely to be approved by Welsh Highways, or laid on the surface through the SSSI, unlikely to be approved by NRW. It is also undeniable that the National Trust has lent credibility to a scheme proposed by one of the most heavily polluting companies in the world. We are reassured that Natural Resources Wales, as the statutory consultee to the proposal, and as the government body responsible for protecting the environment and its natural resources, has considered potential impacts to the SSSI, Protected Species, Protected Landscapes, environmental pollution as well as access and made no objection so far to the scheme. We are further reassured that the Snowdonia National Park Authority, in line with their core purpose and statutory duty will judge the social and economic impacts of this RWE Innogy proposal. I am shocked by this statement. The National Trust is involving itself in a major energy project in a SSSI. It is in partnership with RWE, a multinational power company that does not have a glowing reputation for social or environmental responsibility. Yet it is totally absolving itself of any concern for the effect on the habitat of the Fairy Glen or the community that surrounds it. Why is this all left to the statutory bodies to consider? Does the National Trust not have its’ own experts it can consult on environmental matters? Should it not hold a higher standard for conservation and community protection than the government appointed bodies? 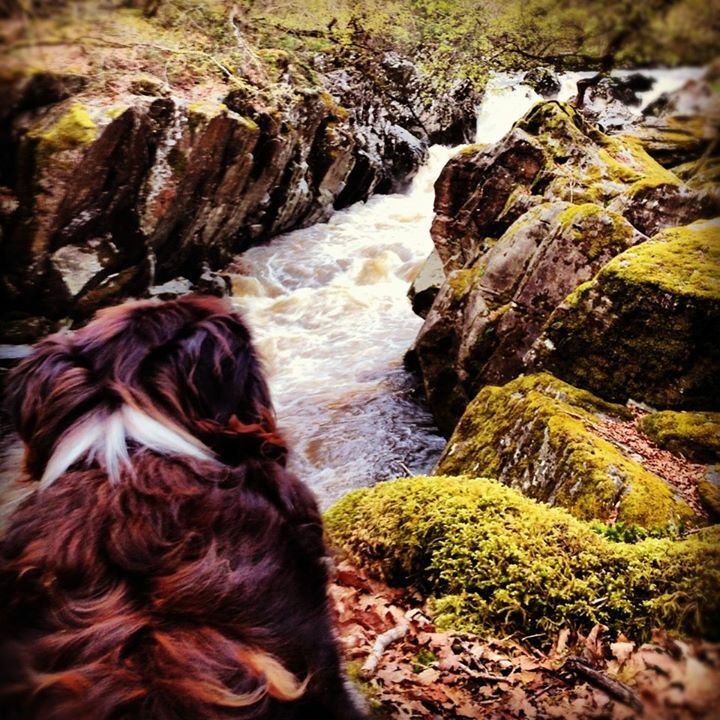 In recent years we have worked collaboratively with individuals and community groups who have developed hydro power installations, including tenant farmers, community groups such as Abergwyngregyn and Bethesda in Snowdonia, and we feel we have always been open, transparent and consultative in our approach. There can be little criticism of the National Trusts support of community energy projects; especially those such as the Ynnis Ogwen scheme in Bethesda being built in a post industrial site. You have to see that this is completely different to renting out land left in trust to a multinational energy company to build a scheme 50 times larger (by installed capacity) in an unspoilt river system. As regards the distinctly separate matter of the Trust’s own renewable energy strategy, I warmly invite you to meet our colleagues at Hafod y Llan in Nant Gwynant, to discuss completed schemes that have been hailed as exemplary from many quarters, as a way to perhaps better help understand our energy vision. The Hafod y Llan scheme has indeed been held up as exemplary particularly by the Trust itself. Again I struggle to see the comparison between a small scheme on an upland stream which is relatively sterile due to former mining works and the Conwy scheme; many times larger on a lowland major river and containing highly sensitive and nationally import habitats. I feel I understand the National Trusts renewable energy vision but please correct me if my understanding is incorrect. The Trust is placing hydro schemes on rivers across Snowdonia and renting land to a multinational power company to do the same. However the Trust does not use a single Watt of the power these schemes produce. This power is all sold to the grid claiming the high rate FIT payment scheme. The National Trust then buys standard mix electricity (including fossil fuel and nuclear generated power) at far lower wholesale prices. This energy policy could at the most generous be described as a form of offsetting but is effectively profiteering. I know some of the electricity generated in the community based schemes the NT assisted in will be used locally but this is not the case in the Conwy scheme or many of the NT owned and operated schemes. Please be assured that we will continue to act in such good faith to all sides in this ongoing discussion and will keep an open mind with regards to any changes to the proposed development, or any new evidence. Keep the pressure on a key player in the inappropriate development of this beautiful river. Email them at the addresses below and post and comment on their social media feeds.